These were easy to put together, seem sturdy and look really good in the room we are redoing. Established in 2008, Costway is building its reputation on a 8 year history of helping consumers achieve their financial targets with satisfactory product quality and best price. Costway provides our consumers with plenty of choices from home and garden items to sport and hardware equipments, from vehicle and DIY projects to business and industry products. Find whatever you need for your daily life and activities from our online shop with impossible low price and highly expectation! For customer service inquiries or to initiate a return, please contact Costway at cecilia@fdsintl.com. You can initiate a return for new and unopened items within 30 days of delivery for a refund. To qualify for a refund, items must be in new and unused condition with all original materials and/or accessories. If a return is not received at our processing facility within 30 days, it may be subject to a partial refund. You will be responsible for return shipping costs. However, if the return is a result of a fulfillment error, product defect, or damage incurred during shipping, we will refund the full cost of the merchandise. We will provide a pre-paid return shipping label for Non-Buyer's Remorse returns. All returns are subject to inspection, and if found not to be an error on our part, the return shipping costs will be withheld from your refund. SPECIAL RETURNS INSTRUCTIONS: The Seller cannot accept returns for used items. The Seller charges a restocking fee of 10% that will be withheld from the refund. 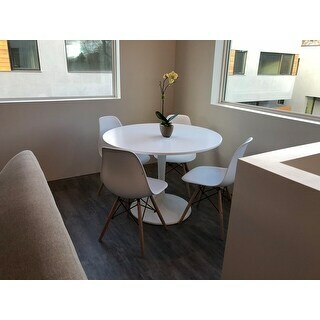 4PCS Mid Century Modern Style DSW Dining Side Chair Wood Legs,As A Sophisticated And Elegant ABS Dining Chair, This Item Will Perfectly Decor Your Dining Room. It Is An Ideal Solution When You Have Guests Over For Drinks Or Dinner. And It Has A Ergonomic Back Designt, And A Wood Legs Design, Which Makes It Stylish Yet Comfortable At The Same Time. Don't Hesitate To Buy It Now! 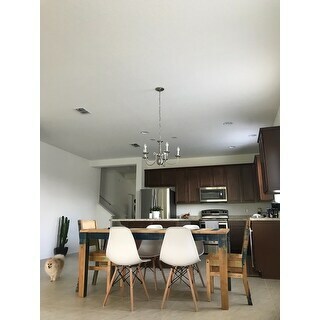 I received one chair with the leg broken, and after calling overstock to give me a solution, they are telling me that it is not there problem, that it is problem from the seller (Costway) and they are not taking responsibility, and the buyer has no more stock, so Im finding myself with one chair missing and no one is sending me a replacement for the broken part or a new chair, that it is what they should do, give me a new chair because I bought it through overstock, not costway, so overstock must take responsibility and send me a new chair, in there web I can find the missing chair all around, and still they are telling me that it is not there problem but costways and washing there hands, I repeat I bought it to overstock, not costway, so someone please give me a solution. 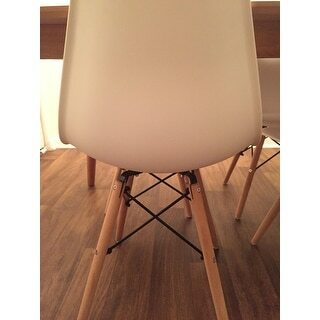 i love these chairs for our dining room, we have a scandinavian mid century modern look to our home and these are perfect and surprisingly comfy chairs! sooooooo easy to assemble! These chairs work perfectly for my dining table. The assembly was very easy to put together. My issue with this order was that I ordered 2 sets of 4 chairs that came in 2 separate boxes making it an order of 8 chairs total. Both boxes were EXTREMELY beat up with punctures and holes all over. So when I opened the box there was no bubble wrap or protective cover over the chairs and legs. Just a piece of plastic cover the items. 3 of the chair legs were marked up with black marks on the natural wood color and 1 chair seat was completely busted and cracked up and 2 of the seats had markings on them (I ordered white so they had black smudges that I couldn’t wipe off not super noticeable but I wanted them perfect since I just got them). I reached out to overstock and was forwarded to request part replacements and someone from the Costway would reach out to me and rectify the issue. I sent Costway pictures of the damaged pieces and they offered to refund me for the price of 3 chairs and I could just keep the damaged chairs or throw them out. This worked for me because they care in sets of 4 and I only needed 6 or 7. I threw out the one that was busted and will have to use the 2 damaged seats but at least they’re free so I would complain too much especially since the damage isn’t too noticeable. I would recommend that Costway packages these chairs differently with bubble wrap and cushioning so there is a less chance for the chairs to get damaged. Other than that the chairs are great! I really like how these chairs came with the bottom section already assembled! I've seen other reviews for similar chairs where the bottom portion has to be assembled piece-by-piece, but not this set! It made assembly that much easier! These chairs sit very comfortably. The design and shape of the plastic chair perfectly hugs your bottom and the back provides great support without being too stiff. There's some give in this chair when you lean back, so it's not as uncomfortable as I had imagined originally. Sure, I had little hopes for this set of chairs with the cost being so cheap. If you're looking at this set, you've probably seen similar sets that are upwards of $***. Don't let the price tag be discouraging! These chairs are the real deal. My only complaint is the amount of packaging! It took longer to take the plastic off the legs than it did to assemble the chair. Note to the supplier: Maybe wrapping each leg in paper would work? Saves plastic! Update: I've had these chairs for about five months now, and they're still in great condition. No complaints! I've even had dinner guests over who complimented how comfortable these chairs are. Still give it a 10/10. I'm glad I waited 6 months to write my review. If I had written it as soon as I received them, my review would have been 5 stars as well as many of the reviews I had read prior to purchasing these myself. These chairs were put in a dining room where we have used them about 10-15 times since September 2017 when I ordered these. As of today, my fourth one broke as I sat on it. My husband is extremely handy and this is not any fault of his - the chairs are extremely cheaply made and apparently cannot handle the weight of normal people without the brackets and screws falling off. I had several guests fall onto their butts while trying to sit on these so that is why I moved them over to a room where no one would sit on them anymore. They are beyond repair and even if they were repairable, I do not trust the quality of these chairs now to have a guest of mine sit on these. They are very stylish and for the price, I guess I shouldn't have expected them to last very long but it hasn't even been 7 months since I've had them! I have only ordered from Overstock several times but I was hoping to have the same experience with quality as I did but unfortunately, their CS is lacking. This is why I will continue to shop on *** since they back up their products, EVEN IF they are sold by a 3rd party seller. I will update if Costway provides a reasonable solution. quality is generally fine, looks nice, and matches perfectly with my dining talbe. the problem is, it took me a long time to assemble these chairs, because the supporting legs come pre-assembled, all I need to do is to screw the legs into the seats. But, the screw holes on the legs are not perfectly aligned with the seat, and the tools that come with it is very small, not handy. The chairs are perfect for the space. 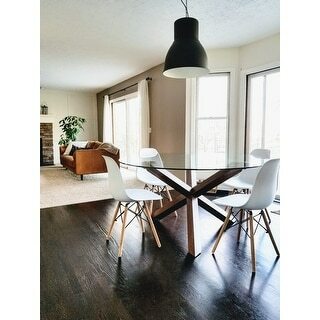 I wanted some mid century feel to my dining room without going too overboard. Very easy to clean. 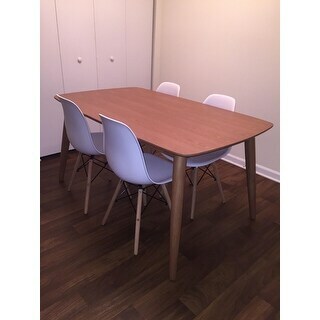 These chairs look grt with my vintage mid century dining table. They are sturdy and this is especially important to me as I bought them to replace my IKEA chairs, one of which broke days before guests arrived for the holidays. These were easy to put together and the molded seats are very comfortable. Overall, I am happy with this chairs. I really love the style and think it's a great choice for the time being. They are trendy and modern, which fits our style. They are super easy to clean and lightweight. As far as quality, they are just okay. There is a little bounce when you lean back and they will squeak when you sit down, which makes me feel like they won't last forever. I don't think I would recommend if weight was an issue. I was questioning the quality because of how cheap a set of four were, but I was wrong! 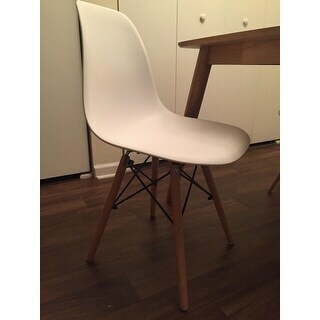 The quality is awesome, they look great, and were exactly what I was wanting when I was looking for the mid-century modern / Eames-esque look for my dining room! Highly recommend to anyone in the market. I am suing these chairs for a rental apartment. They are great and easy to assemble. I was really skeptical when I ordered these chairs because of how cheap they were compared to others just like them. 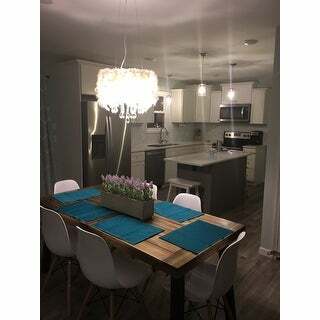 *** is what I paid for a set of four dining room chairs that are beautiful and high quality. Im so glad that I took the chance and ordered these when there weren't any reviews at that time. Another great Overstock purchase!!!! Very nice for the price, I paid *** for 4, and it looks amazing with my wood table, ease to assemble, one little piece missing tough. So far so good. Works for our space. Can't go wrong with this. Used in my rental, simple, stylish and effective! Although I love the look of the chairs, they are super flimsy. Get what you pay for I guess. Easy to put together, look great, very sturdy! The chairs arrived in great shape. The quality is decent. I had to spend some times to tighten up all the bolts as some arrived loosen. It is not too flimsy but I don’t feel comfortable stretching my back on it - afraid that it won’t be able to absorb and support all the weight and movement. Wow!!!! What an amazing value. I purchased 2 sets of 4 of these chairs. I purchased these for the mid century modern asthetic. Chairs were easy to put together and are comfy. Can't beat the price! Sturdy, quality chairs. The one thing I couldn’t see in the picture Was how bright white they are. I don’t have a problem with the starkness of the white but thought I’d mention. I highly recommend these mid-century looking chairs! The chairs came perfectly as expected. The only thing that was kind of off was the condition that the box was in. There was a hole in the side when it was clearly labeled fragile. The chairs themselves were fine and they were pretty easy to put together. Purchased a set of 4 plus 2 more for our beach house, which is also a rental. They are fantastic, especially for the price. They are sturdy, easy to clean and look great. No wobbles or no broken chairs so far, and our home has a lot of activity. Great product! "I’m trying to find the matching table is it on overstock?" "Can it hold the weight of a 6'-4" 290lb man?" I have this set and am satisfied with the cost/value/quality. However with that said I don’t think it will stand up to the daily use of a 290lb person. I’m 200 and over all feels comfortable and secure to me. The back has a little flex, but not weak feeling. Just not convinced it’s strong enough for much more weight. Note to buyers: regardless of weight I’ve found it’s a good idea to retighten screws/bolts every few months. Or at least check them. "What is the weight restriction?" "how much weight can these chairs hold"
They are pretty sturdy, I've had people over 200lbs sit on them without an issue at all. "How do I find replacement hardware?" I was able to request extra hardware from the seller. Try contacting them through Overstock. "Has anybody gotten an answer to the question: Is this price for FOUR chairs? If it’s only for one chair with four legs...that is seriously misleading. " Yes, this is a set of four chairs. "How much weight can one chairs hold up?" What the width and how long is it?